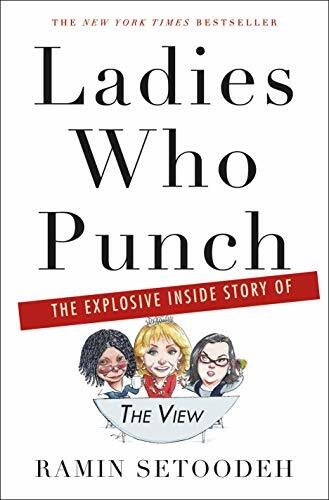 Titre Ladies who punch : the explosive inside story of "The view" / by Ramin Setoodeh. "The gossipy real-life soap opera behind a serious show! When Barbara Walters launched The View, network executives told her that hosting it would tarnish her reputation. Instead, within ten years, she'd revolutionized morning TV and made household names of her cohosts: Joy Behar, Star Jones, Meredith Vieira, and Elisabeth Hasselbeck. But the daily chat fest didn't just comment on the news. It became the news. And the headlines barely scratched the surface. Based on stunning interviews with nearly every host and unprecedented access, award-winning journalist Ramin Setoodeh's book takes you backstage, where the stars really speak their minds. Here 's the full story of how Star, then Rosie, then Whoopi tried to take over the show, while Barbara struggled to maintain control of it all, a modern-day Lear with her media-savvy daughters. You'll read about how so many cohosts had a tough time fitting in, suffered humiliations at the table, then pushed themselves away, feeling betrayed--one nearly quitting during a commercial. Meanwhile, the director was being driven insane, especially by Rosie. Setoodeh uncovers the truth about Star's weight loss and wedding madness, Rosie's feud with Trump, Whoopi's toxic relationship with Rosie, and Barbara's difficulty stepping away. Plus, all the unseen hugs, snubs, tears--and one dead rodent. Ladies Who Punch shows why The View can be mimicked and mocked, but it can never be matched." --Dust jacket. Contenu Prologue: Out, damn co-host! -- Part one: Barbara's view. Everybody's a critic ; Audition ; Barbara does daytime ; Death becomes her ; It's a hit ; The star diaries ; The Republican ; Bridezilla! ; Meredith's great escape ; Scandal -- Part two: Rosie's view. The Queen of Nice ; All aboard! ; Rosie vs. Donald ; Ladies who punch ; My mouth is a weapon ; Rosie detox -- Part three: Whoopi's view. ; Sister act ; Elisabeth's last stand ; Mommie dearest ; Barbara's long goodbye ; She's back ; "Worse than Fox News" ; Enjoy the view, while you can -- Epilogue: Trump's view.